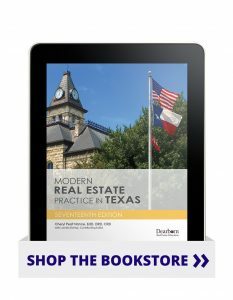 The newest edition of this classic Texas text is packed with all of the detail and analysis you’ve come to expect from a Modern Real Estate Practice book. Reorganized and revamped to cover the latest laws from Texas legislature, this is the most comprehensive prelicensing textbook in the state. In Practice and For Example sections emphasize real-life issues, and a variety of margin notes expand on key ideas.